I do just about anything that I can to get my eight year old son to read. It just is not something that he is all that interested in, so I am always looking for books that keep him interested. We just received a graphic novel from Sanjay and Craig and Papercutz for review, and he really likes it! While there is not a whole lot os "reading" in this because it reads more like a comic book, it is something different from the tablet or Xbox that he is interested in, and that makes this mama happy! He happily read the book for over 30 minutes this afternoon without complaint, and if he loves it that much, I know your school aged kids will as well! 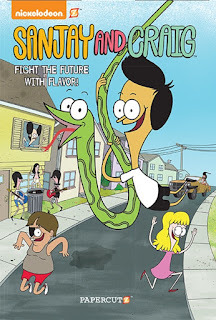 Upcoming graphic novels will feature other Nickelodeon animated shows including Breadwinners, available on November 17, along with Harvey Beaks and Pig Goat Banana Cricket, set for release early next year. The graphic novels will collect comics from the recently launched Nickelodeon Magazine, a monthly publication which aims to give fans a new way to experience the Nickelodeon animated characters they love through original comics as well as games, puzzles and other activities for kids.